Are the pages of your website optimized for the search engines? If not, you are missing out on visitors to your website and to your church, missing out on people who are looking for God. On-page optimization is the essence of search engine optimization and the key to targeting the keywords that can make your website a success. Can The Search Engines Even Read Your Site? If you have a Flash® website, you may have an “Alternative Content” feature which creates an html page of the content of your website. Some site’s don’t have this option and even when they do, it’s often more difficult to fully optimize. I recommend not using a full Flash® site. You can use Flash® on a site, just set it up so the site itself is an html site and just have some Flash® elements. Keep in mind that any Flash® elements will not be able to read by the search engines. If you have much of your content in images, they it would be a good idea to change that so the content is in regular html. These days you can use CSS to stylize the text so you don’t have to use graphics for text. 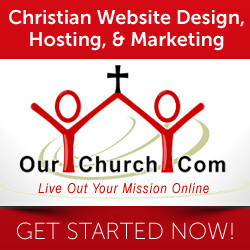 SEO Is Hugely Important for Churches! SEO is important for any site, but for churches it’s even more important for churches. Look at the image to the right. Those are the search results for “church near Colorado City, AZ”. 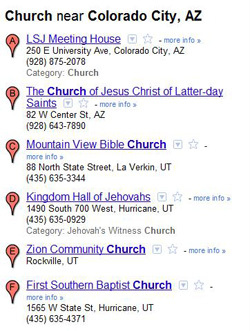 Three out of the top four results (including the top two results) are Mormon or Jehovah’s Witnesses churches. Generally speaking, about 65% of all searches click through the top two search results. So, when someone is looking for a church who doesn’t know one church from the next, how important do you think it is for your church to be number 1? It could literally be the difference between a person becoming a Mormon or a Christian. With the stakes being so high, let’s take a look at what you need to do to optimize your church’s website for the search engines. Once the tech assistance company is known as, their very first responses are to obtain general idea concerning the product, its specialized problems as well as what restore services tend to be implemented till time of producing that phone. In on-page optimization there are several strategies to get a good traffic to your site. It's not an easy task to do, it takes much time to get a traffic, but at the end of the day you will come to notice the best results. Like you need to add more back links to your pages. Each page you need to add so that the more time a search engine crawls your website and stays in it, the more chances to increase your page rank. Hey, I've recently started to learn about social networking, link building some basic tips about search engine optimization. Your post really helped me a bit to improve my knowledge. Thanks for sharing beautiful article. 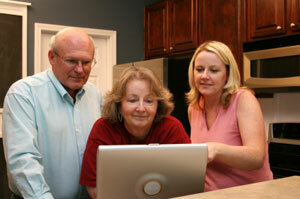 I have more knowledge about australia writing research paper services. Those are helpful to all the blog writers and content writing users. These are all given good education to our future life. Thank you so much to your educational services. For specific keywords to help search engine rankings as well as for you. Good learning for these keywords. for better improvement to your website you needs to make an on page optimization for your website, it helps you to run your website the better, also agree with the points given in this article. It is really very useful information for optimization. It can come in handy more than once throughout their lives! What is health Insurance. The main reason why you need an affordable health insurance is to help you plan ahead in case of unexpected costly emergencies. I really enjoyed reading this article as it gave a lot of insight in the ministries efforts to attract more visitors. The information greatly outlines the uses for SEO and helps one understand how to maneuver the landscape. yeah I am very glad it is now free to everyone. This is a decision that really helps to create more equality for everyone.. This is truly a great read for me. This article provides enough useful information to increase knowledge about on page seo.